Plants aren’t the only living organisms that metabolize sunlight, we human beings do too. While the relationship daylight exposure and our health isn’t simple, it is important to know. Most people are aware of the risk of skin cancer from long exposure without protection, a number of studies and scientists suggest that moderate exposure leads to a surprising number of health benefits. Daylight helps lower blood pressure. A group of researchers from the University of Edinburgh found that as soon as daylight hits the skin, a compound is released that helps lower blood pressure. The most well-known health benefit of daylight is the creation of Vitamin D when daylight hits the skin. The creation of Vitamin D also creates Vitamin D3, which has been shown to reduce risks of bone fractures. A study by the University of Cambridge found that higher levels of vitamin D were correlated with higher levels of cognitive function. The inverse was also true, where lower the levels of Vitamin D among those with lower cognitive function. Even more studies have shown that daylight could help with grown of nerve cells in the hippocampus, which is responsible for creating and storing memories. A lack of daylight can cause a condition called seasonal affective disorder, or SAD. SAD is a common mild form of depression in the winter months or for workers who have long hours in artificially lit buildings. Moderate daylight increases the levels of natural antidepressants in the brain, like serotonin. When daylight hits our eyes, the brain sends a message to the pineal gland to stop production of melatonin, the hormone mainly responsible for making us drowsy. When it starts to get dark, the message stops and melatonin is produced again. Over production of melatonin during the day leads to low levels at night, making it harder to fall asleep. Daylight improves growth in children. Studies have revealed that amount of daylight a child gets, especially in the first few months of it life, has an effect on how tall the child grows. Daylight improves the immune system. Daylight helps suppress an overactive immune system, which is why daylight is used to treat autoimmune diseases like psoriasis. Daylight also causes an increase in white blood cells, which play a key role in fighting diseases and infections. Daylight reduces risk of some cancers. Scientists from the University of California noticed that higher levels of Vitamin D drop your risk of many cancers, especially colon cancer and breast cancer. Other studies show that Vitamin D supplementation produce a dramatic 60% drop in risk of developing any form of cancer. The biggest reasons for these health benefits is the full spectrum of color that daylight provides. Most artificial light is on the yellow spectrum only, whereas natural daylight carries the full spectrum, especially blue. It is important that daylighting systems must not filter out the blue spectrum of light. These benefits cannot be achieved without the blue spectrum of light. When a daylighting system has yellowed it is actually a failed system because it is filtering out the blue spectrum of light. Seattle Public Utility used CPI Daylighthing’s Quadwall® sky and wall light to earn Gold LEED status on their new 33,000 square foot South Transfer Station. The Quadwall offers 40% light transmission without any additional artificial lighting on an average Seattle day. And because SPU processes up to 700,000 tons of trash annually, every detail counts. We were very concerned about hot spots and glare temporarily blinding equipment operators with light and we haven’t seen any of that [with the Quadwall]. The natural light has been a big help and improved color recognition. We have a lot of heavy equipment and customers moving around and it’s better everyone. Quadwall is a system of two independent translucent insulated panels, resulting in one integrated, high-performance daylighting system. Quadwall is the only system that can provide indefinite building envelope protection with its advanced RST — Removable Skin Technology. What Is Removable Skin Technology? This product has the ability to remove the outer skin without disturbing the inner portions of the building. For instance, a bad storm hits and debris damages some of the panels. To repair the building, you only need to remove and replace the damaged exterior panels. The interior panels are left in place and maintains the safety of the people and operations inside the building. Being able to include a lot of daylight in the facility means that we’re not relying on the electric lighting. Quadwall can also be configured with additional insulation, FM-Rated Class A/B fire-rated roof assembly, sound reduction, dynamic shading, additional structural performance or even military forced entry resistance. Joined mechanically, Quadwall does not use vulnerable adhesives, for long term durability and performance. Quadwall’s nanocell technology creates even light distribution and removes glare. This is a huge upgrade for Seattle Public Utilities to have even distribution and good quality of light to operate in. Per code, the South Transfer Station was required to meet FM-rated Class B roof construction. With a proprietary insert, the scalable Quadwall was the only solution. CPI had the right balance – what we needed for the Class B roof and the level of quality we were looking for with the price we could afford. The mechanically interlocking connection was a bonus for South Transfer, helping to seamlessly integrate the sky and wall lights with the building’s exterior metal paneling. Skylight Specialists was contacted by General Contractor Brinkman Construction. They wanted to bring in Daylighting into a 36,000 sqft warehouse. 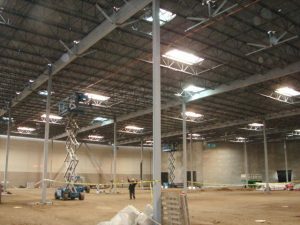 Their goal was to achieve savings to the lighting costs of such a large indoor space. The placement of the 4’ x 8’ translucent skylights bring in a tremendous amount of light. The dramatic scene shown above illustrates the need for very little electrical illumination. Bringing natural daylighting into the workplace or schools for that matter achieve better attendance, higher productivity and even health into the structure. Daylighting studies have shown that when you bring in the blue spectrum of natural daylight you make your workers and your students better and healthier people.